Mat Board & Supplies → Decorative Mat Board. No window. Decorative Mat Board without windows. Available in standard sizes from 8 x 10" thru 30 x 40"
We stock Crescent® brand Decorative Matboard. It is pH neutral and buffered with calcium carbonate. • The board is 1/16" (55-60 point) thick. It has a cream core and white back. It is rigid enough to be used as a backing board for smaller mats, to prevent warping during shrink wrapping. The facing paper is highly fade- and bleed-resistant. 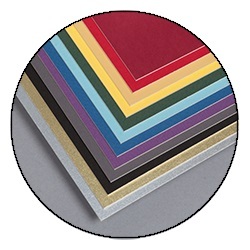 Decorative Matboard Colors - Click here for larger color chart. Click on color drop-down to choose mat color. Mix 'n' match pricing for window/no window mats, as well as colors. MINIMUM 5 per color per size. Use our acid-free polyolefin shrink film or shrink bags, or our bioriented polypropylene (BOPP) sleeves with a resealable flap to protect your images from environmental pollutants, fingerprints, and grease. Click here to see our greatly expanded line of wood and metal frames. Matboard is 50-55 point thick, pH neutral and buffered. Click on color drop-down to choose from 30 matboard colors.